British prince who, while heir apparent to the British throne, takes an active interest in civic issues such as architecture, the environment, education and disadvantaged people. The Prince congratulated the Indonesian President for the initiatives he had taken to address the problems. Then the Prince explained the Rainforests Project he had started to help with the needed funding. For the remainder of his time, Prince Charles addressed how he believed the governments, companies and institutions around the world could become involved in constructive actions and the possible approaches to raising financial assistance. Prince Charles referred to the initiatives that were already in progress. “There are moves afoot to develop markets that can provide incentives to reduce deforestation. But this may take too long and we do not have the luxury of time. That is why we must find a way of anticipating these markets and helping them to develop; of mobilizing the truly awesome power of private sector capital to provide emergency financing. This is at the heart of my Project. Science Quotes by Charles, Prince of Wales. Prince Charles - Context of the “Forests are the worlds air-conditioning system” quote - with medium image (500 x 350px). Prince Charles - Context of the “Forests are the worlds air-conditioning system” quote - with large image (800 x 600px). 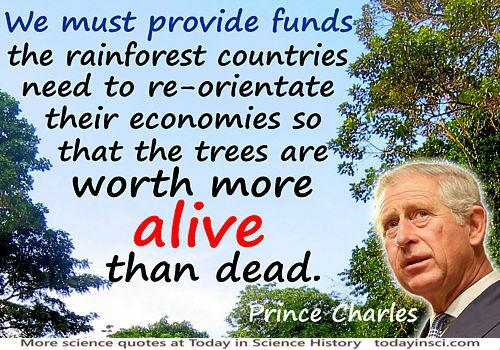 Prince Charles - Context of the “Rainforest countries need to re-orientate their economies so that the trees are worth more alive than dead” quote - with medium image (500 x 350px).